Embarrassingly, the first quilt started for my book was the last one finished and photographed. You may remember seeing a bad picture of this quilt quite a while ago, but I thought you might like to see a good one. 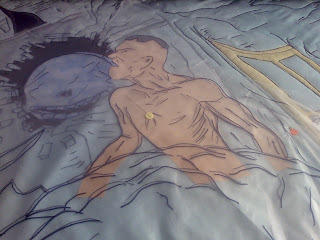 This quilt was very much made for my bed. I love the black and silver fabric in it, and I was determined to have a quilt with it in. I also wanted to check the quilt worked with as few as three fabrics. 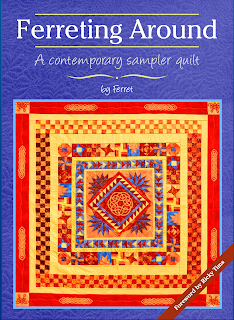 This quilt really divided opinions, but whatever others think, I love it, and it did good service as the book sample. Well it's exciting to me, and I would hope about 10 others. The QuilTarT t-shirts have arrived. My regular Thursday night students who are responsible for the quilt in my book, have offered to come and help look after my gallery at the NEC. We thought some sort of uniform might be a good idea, and well with me that means t-shirts. I asked what they wanted to be called and they came up with QuiltTarT. I am thrilled with the shirts, and I hope my helpers will be too. Just to round that off, it had to work for a lady who was going to join us the next term to start learning quilting and teach something to those who have been quilting longer than me. the standard class length (for the weekly classes) where I teach. It means they leave their first class with something they can show off. So if you see anyone wearing a black t-shirt that says QuilTarT you will know who they are. You see quilters crossing over into all sorts of other areas, but I wonder if this is a first. 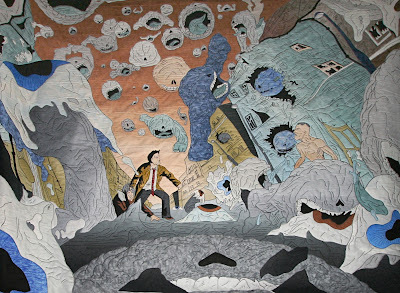 Having my quilt displayed on Forbidden Planets web site is something I never expected. I am thrilled it has captured their imagination. I would love to see this craft being picked up by more people with different ideas. There are already plans for me to do a couple more projects with comic artists and I am really looking forward to them. They have their own set of challenges and well, they are different. I'd love to take this further, but well you will just have to watch this space. Right now I have some celtic knots demanding my attention. I've made good progress today with the smallest of the art quilts I needed to complete for the Festival of Quilts. I've not quite finished quilting it but I don't think I am much over an hour off now. As soon as I have it off the frame I will get on with the next small quilt. I am starting to think I might actually get things finished. I've got a lot of hand sewing to do and some other bindings, but overall it is starting to come together. It is amazing how much more you can get done when you don't need to go out two days a week. I love my classes but the extra time to concentrate is really valuable right now. 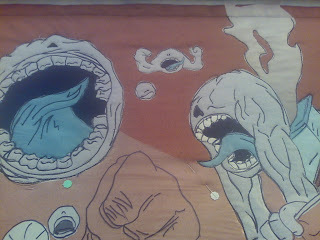 I'm sorry but I can't (won't) show you this piece until the show. It is a swap quilt and I want it's new owner to see it in it's best possible light. It will just have to be a surprise for you all. Hmm I forgot how fiddly cutting could be. I've gone straight from the biggest art quilt to possible the smallest and most intricate I've done. I was looking forward to dealing with smaller pieces of fabric, I thought it would be easier. 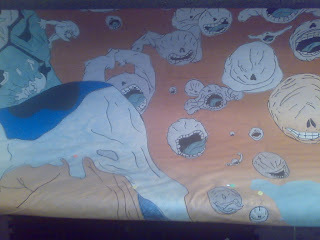 I had entirely forgotten how small some pieces are and how hard it is to cut them out without the fabric falling apart. 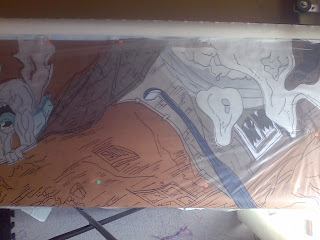 Also when doing this really complex cutting I have to keep ironing the freezer paper pattern back in place with the bigger (all things are relative) piece on Bad Rain it was easier. Still the quilt is looking good even though it is progressing quite slowly at the moment. Being small I am making the top first and then mounting it on the longarm frame. It's nice to be able to sit and work and to be able to listen to audio books without wearing headphones. Well that's it. It is off the frame. I didn't realise while I was working quite how big it is. When Cy described it as a "Bad Rain: A Double-Page Bedspread" he was quite right. The picture doesn't show all of it because it more than covers our king size bed. Of course it wouldn't actually be any good as a bedspread, it's too fragile and too heavy, but size wise it looks the part. I thought you might be interested in some facts and figures about this monster of a quilt. When bound the quilt will be at least 90"x70"
over 15m of ombre fabrics went in to this quilt. 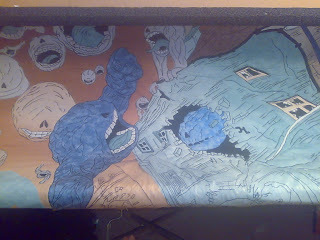 In ten days all that had come together to make my version of the double page spread from Cancertown. I am thrilled with it and I can't wait to see it hung in my gallery at the Festival of Quilts. It will be the first chance I get to have a really good look at it. I hope some of you will be able to join me there. I think I will take the rest of the evening off, and get on with a small art quilt tomorrow. The end is in sight. Today I have mostly been making blistermen and looking for badmouth noses, which have a habit of running away. 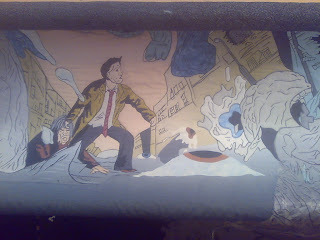 Doing the quilt really brings home how big the bad guys are. I've got one more badmouth to cut out, but I am putting it off. I think it is about 60" wide, so it will be a pain to handle and get into place. A job for early in the day I think. Still hoping to finish tomorrow, keep your fingers crossed. I have spent most of the day working on this one small area. It has a lot of pieces in it and requires new colours. However it is now finally looking like I am making progress so I thought I would share it. I think this is the last intricate are of the piece, so I should be on target for getting it off the frame over the weekend. 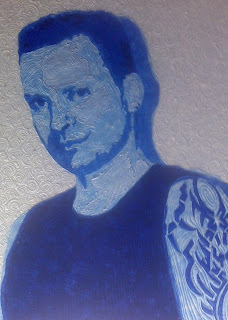 Woo hoo, he's quilted and I think he looks pretty good. This is my first quilting task for today. The lines you can see in the picture are the markings, I need to stich them in now. This is the first of the human character I need to do and as such is a big deal. The people are tiny yet they are the focus of the story and therefore the quilt. Having looked at the picture I am hopeful it's going to work. Last night when I stopped I had a couple of concerns. The biggest one (in more than one sense) was the fist under the eyeball. The problem is I didn't think it looked like a fist anymore. It looks fins in the book, it looks fine in the pencils but my pattern and the quilt looked wrong to me. This morning I've taken a look at the photograph and I can see it again. I find this happens quite a lot when I am working on big pieces. They are hard to take in and see what they really look like. 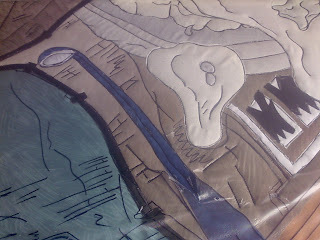 It's something I also see in students when they are working on my art quilts class. They can't see their picture is working so I take photos for them with my phone. It always helps, even if one lady declared her rose a yellow cabbage! Feeling somewhat encouraged I think I will start the day by cutting my fist. It will take a disproportionate length of time, as it is a large piece of fabric, but it will bring the overall quilt on in a leap so it will help encourage me for the day. I also know it has lots of very satisfying quilting to be done on it to make it's muscles at least two and a half d. Fun fun fun. It's reached the point where it is too big to photograph, or indeed see properly. I hope the pictures will give you an idea of how it's going. I've got a new favourite badmouth. I have always liked the ones with their arms folded, but now I have a new fondness for the dark one with it's arms out. It is in the crease of the book, so it doesn't get much appreciation, which is a shame as it is a very detailed badmouth. I wonder if if was one of Stephens pets as well, as it seems to have a lot of work in it. Maybe that is party why I like it so much, I've spent a lot of time working on it. I think each line takes about a minute whether they are 1/2" or 3-4". Most of the time is in the starting and stopping the line, so the areas that have more lines in take a long time. As you can imaging the side of the building has been another very time consuming area. It's been fun too. In fact I've been really enjoying working on some thing completely different. I'm also starting to think about which of my other projects (hmm I nearly typed problems, how Freudian is that) I will move onto next. I have two small ones that need to be done before the show and I think they might be the next stop. They are more the sort of thing I usually do so will be another complete change and being small I should be able to finish them relatively quickly. I find it helps keep my going if I can have a few quick targets then a longer one. I've been a bit quiet since yesterday afternoon, because I have been panicking. I bought a lot ombre fabrics just to make Bad Rain. 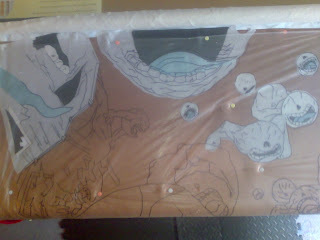 It arrived in several packages, and looked great. I thought I had put it all in the appropriate project pile. I tend to overbuy rather drastically for most projects, especially if I have to buy from America. So yesterday when I realised I had two large pieces still to cut I started to worry. I've been trying to get on and cut all the really big pieces. I've managed all but one piece and the ground. So as soon as Tet got home he had a look though my stash to see if he could come up with any good solutions. He found the perfect fabrics, then one package I had entirely forgotten and left in the wrong place! I now have the perfect fist and ground fabrics and can press on with a lot less stress. I didn't think I would have ordered so little fabric, so finding the other 25% has helped. Being the sad person I am, I am really excited to get on with the quilt. I'll try and take some more picture later. Who would have thought drain pipes and gutters would be so satisfying, but they are. 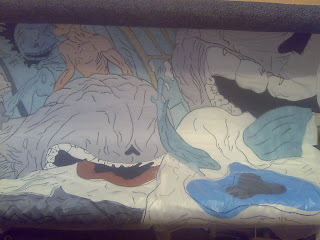 It's what makes the blob a house, and they are quite fun to stitch. All the black lines are sewn and they become the quilting on the quilt. Check out the comments on the previous post for more on sewing pencil lines. As Stephen has borrowed a picture from me I thought I would do the same from here, exchange is no robbery and all that. He is the artist behind this image, and this is what I am trying to recreate. I am only using commercial quilting fabrics, so I won't be getting a perfect colour match. However I do think I should be able to capture the essence of the image. I have discovered a lot more detail in the picture than I had noticed when I saw it in the book. There are huge variations in the pencil strokes, that will be a huge challenge to reproduce. The most problematic areas are the human faces. They are very small relative to the whole piece but very important. I am happy that I have got them just big enough to render them. I have to admit I am really enjoying working on this. It is very different for me, but I like the locks of colour I am using then adding the 'inks' over the top. Look out for more updates tomorrow, remember I am on a very tight schedule with this one. I've sewn as much as I can before I add more pieces. I'm really pleased with how it's working out. I had planned on using lots of colours of thread but I think the black will give me a better result, so that's the way I will go. It will mean some of my lines will be stronger than the originals, but it should look pretty similar. Just about to start stitching. I've got fabric on all the way across the width of the quilt and I can't roll on until I sew this bit down. Wish me luck. This is my current project, Bad Rain. 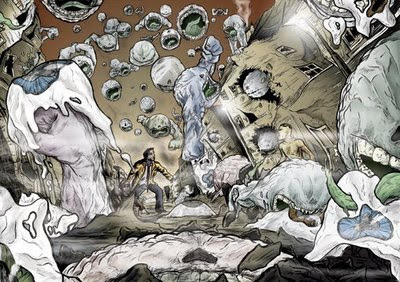 It is taken from the Cancertown graphic novel written by Cy Dethan and illustrated by Stephen Downey. I am very lucky to have been granted permission to make my version of this image which appears in the book as a double page spread. You may recall that I have said some of my recent quilts have been test pieces for another quilt, well this is it. 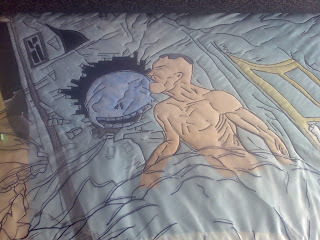 I've needed to come up with new ways to approach making art quilts to have a chance of pulling this one off. I've made two pieces recently where I have tried very hard to maintain the style of another artist, I am pretty happy with them and will be applying what I have learned on this one. I've also been playing with ways of assembling large patterns. It's helped, I needed to have less distortions in this one and I've got it. I've also had to have a think about which fabrics I can use and how I can get them in place. I'll let you know how that goes as I progress. I realised yesterday that this is the biggest and most intricate art quilt I have attempted. It's over 90" long and I am not sure how tall yet. I had to scale it up to that size to be able to get the level of detail that was in the original. I felt that the detail was an essential part of the image, it is what gives it the feel of the busy crowded street, so I had to keep it. Also the main character appears in this double page spread so I had to be able to stitch the details of his face as well. Fortunately I've managed to get all those features in and keep the piece just small enough to make on my frame. I could theoretically have made the piece sideways but I find that a lot harder so it's good I can work on it the right way around. I spent most of yesterday tracing the first 40" of the quilt. I decided to work with it pinned to my blocking boards as there is nowhere I can lie it down to trace. It makes it more tiring but it is quicker and easier in the long run. Today I've been able to crack on with putting the fabric in place, although having been teaching today I didn't have much time. Now for the really exciting bit. I need this quilt finished ASAP. I would like it complete by about Thursday this coming week. I've still got other quilts I need to make or finish before the show, so I have to get on with this. If things had gone to plan I would actually be at Santa Pod this weekend, but the weather forecast is for rain so I have gained a day to work on the quilt. I would rather be racing, but I am grateful for the extra time to work. I will try and share progress photographs over the next few days. The picture on this post shows the first few pieces of fabric laid down on the sky . The black lines are all my markings for where quilting needs to go, hopefully I will get that stitched tomorrow morning then I can roll on and place more fabrics. I don't know where to start, it's been a mad few days (it feels like weeks since I last posted but it's only 4 days!) and the title says it all. I guess I will start at the end. Thank you, if you think you might be due it, it's for you. If you think you don't really deserve it, you probably do or will soon :). I can't begin to say how much I appreciate all the support my friends are giving me with my book. Who says self publishing means less support?From the people who have helped me name it, design it and test it, to those handing out flyers where ever they go. It feels now like my book as a life of it's own, and I am along for the ride. It's a very strange feeling, but not a bad one. People have told me publishing is like giving birth, so I suppose it should have a life of it's own. The strangest one I've noticed is my book being listed on Amazon in Japan! Don't know why but google found that as one of the first links to my book. Very strange. I am just about keeping up with enquiries about it, but other email is taking me longer to get to. Bear with me and normal service should be resumed just after the NEC show. These two quilts have been waiting for a long time to get their turn on the quilt frame, but it finally came. I decided I needed a bit more of a breather between large art quilts and these fit the bill nicely. They will both be on display in my gallery at the Festival of Quilts, Birmingham, in August. It's also a great feeling to be able to cross two pieces of my list i n one go. Hopefully they will both be dry and ready to trim when I get back after my talk this evening, which will be another step I can cross off. I had hoped to have more cars for the show, but who knows I may get another chance to show a body of work and I can put them in then. I really do need to find a way to add more hours to each day. I have too many ideas and not enough time. On that note I had better finish loading the car and think about making a move to Kew for tonight's booking. It's been a mad mad week. I hadn't anticipated the amount of excitement and orders the foreword to my book would generate. Having picked myself up off the floor and dug my way out of the emails, we've put the order form up on my website. The pre-order price for "Ferreting Around" is £12 which includes postage within the UK. For those further afield I will charge the actual postage cost, which appears to be £6 to any destination, I will double check that before I guarantee it. I will be accepting pre-orders until the 15th of August at which point the price will be £15.99. Payment can be made by a cheque drawn on a UK bank or by paypal. If you email me the request I will send a paypal invoice. Er, I think that is everything but if you have a question please do ask. I am still a little stunned. I've also been out and about. Yesterday I had a lovely day out, I mean I went and worked hard, with Harben Oaks. I wasn't convinced by a morning talk (OK to be honest I am not convinced by mornings in general) but it actually worked very well. They are a very lively group and I was lucky enough to be speaking at their summer lunch. I was very impressed with lunch and spent far longer there than I had intended. It was a day well spent and I came home inspired and ready to work. So thank you very much Harben Oak. Today I was back at Sprat & Winkle quilters. I did a talk for them earlier in the year and today was teaching a workshop. Again a fun and hospitable group. I was highly amused that they live up to one of my rules of teaching. The person who complains most about their fabric will manage the biggest success. She was thrilled with her work (a journal cover) by the end of the day, and had managed to really loosen up and go with the flow. I was also very impressed with how prolific one student was making not one but three covers in a day! I think though, having looked at several peoples work, my favourites are those using hand dyed threads. This group had several people who brought along really interesting fabrics which made wonderful, personal and utterly unique covers. I hope they will all use them for many years to come and hopefully make a few more. Now I have an art quilt calling to me from the frame. 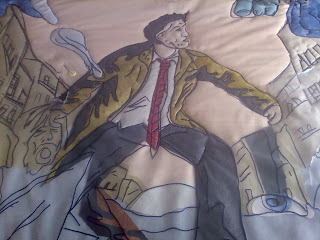 I'd better get some more quilting done, and I might even have a really early night, well early for me anyway. Hopefully you won't have to turn you head sideways, here it is finished. I didn't have time to play with how it was hanging. Sorry. Well I think it is exciting, and I hope some of you will agree. As you know I've been helping out a couple of friends with their new book Cancertown. I was really impressed when they asked a well known comics writer to write them a foreword and he did. In fact he wrote the a stunning foreword. I've joked all along that I was chasing them and learning from what they did, to assist in getting my book out. The foreword seemed like a particularly good idea, I like reading them, and I suspect I am not the only one. The question was who to ask? I knew what sort of person I was looking for, but they are few and far between. 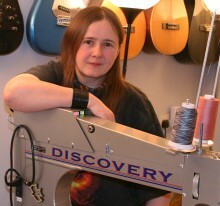 It needed to be a quilter, who did both traditional and way out work. They needed to be technically great, but not afraid to break the rules. I pondered it for some time and wasn't coming up with an answer. When it did dawn on me, I didn't think I had a hope of getting the person to agree, they were just too perfect for the job and way too big in the quilting world to bother with my little book. I plucked up the courage to ask and knock me down with a feather they agreed! I still can't quite believe that Ricky Tims took time out to do this for me, especially as at the moment he is busy working not only on The Quilt Show, but also on his next music CD. Without further ado let me share with you what he has to say about "Ferreting Around". 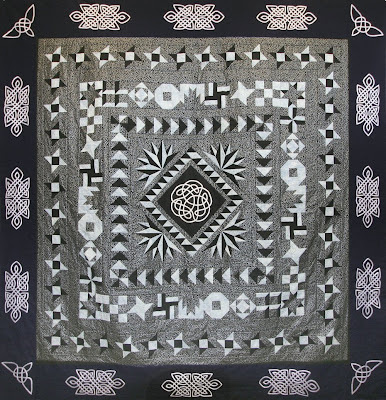 Every now and again, a new talent emerges in the quilt world that transcends the ordinary and is instantly unforgettable. I witnessed this first hand at the Festival of Quilts in Birmingham in August of 2008 when an emerging artist's name was announced again and again as a winner. Not only were her quilts fresh and exciting, but so was the artist who stepped on stage to receive the awards. It was a thrill to see a young talent making her mark in the quilting kingdom. 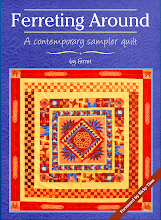 It is obvious to quilters worldwide that the general quilting demographic is of a ‘certain’ age. It is therefore exceptional to me when someone from a younger generation latches on to this timeless art/craft and puts a fresh spin on it. To this I say, “Hear, hear!” However, I have discovered that Ferret enjoys creating her work using a variety of quilting techniques, many of which are rooted in tradition. She does not fly in the face of traditional quilting, but rather she embraces it and includes it into her extraordinary ‘quilting toolbox’. Ferret is young and talented. But being young and talented are not the qualities that I most have come to admire in Ferret. It is her enthusiasm and heartfelt desire to share her passion with others. Many artists have a selfish side—or at least they hoard a few secrets to themselves in fear that someone else might rise above them. Not so with Ferret. She has not chosen to write a book about shocking and unorthodox techniques. Instead she polled individuals to find out what they most wanted to learn. In turn she has authored her first book with you in mind. The techniques included here range from simple to complex, but in every aspect it is written with easy-to-understand language and presented with excellent illustrations. I am honored that Ferret asked me to write a foreword for her first book (thank you, Ferret). I hope she will pursue quilting and fiber arts as a lifelong career. If she does, you are no doubt holding in your hand a collector's item for it will always and forever be—Ferret's first book! I've actually got quite as bit further than this, but the rest doesn't look terribly interesting on it's own. I thought you might like to see the teeth and a bit more belly. I love the belly scales though cutting out the ones for the tail wasn't entirely fun. I have two feet entirely quilted and most of the other parts cut ready to go on. I don't know if I mentioned but I really need this off the frame tomorrow, so I have been trying to press on as fast as I can without getting tired enough to make mistakes. So far so good. I got to talk to the artist who drew the dragon for me today. Those who know me have probably guessed it is Glenn, the chap who drew and indeed tattooed the dragon on my arm. 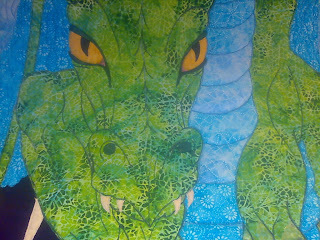 The even more astute will realise this is that dragon. He seems pretty happy with how it is turning out. I can't wait to be able to see the whole thing. I am getting to the point where I can't really see the big picture at all. It's getting hard to work out what things are unless I label them very carefully. It's always a problem when the image is this big and I spend hours obsessing over a small area. Hopefully it will all look right when it's seen in one piece. Well I am making progress and I needed to check the eyes, so you get to see the picture. Working this size makes photographs a really useful tool for checking progress. There is still a lot of quilting to be done in the area around the face, but that wasn't what I was interested in at this point. Having seen the picture I think the eyes will do. Bear in mind yo are seeing this as I do and to be honest probably better. This section is the whole of what I can see in one go, the roller shows in the top of the picture. As you can imagine it's pretty tricky to grasp the whole image when you can only see a section. I'm very pleased with the belly scales too. The ones that have their stitching on are looking very scaly now. I am trying to decide how much stitching they will have. If I stitch shading on it may make them look more shaped, or it may have the opposite effect as it will crush the fabric down. At the moment the fabric sits up and curves the way it should. What I may have to do with this one is take it off the frame with the minimum quilting on it and then drape it somewhere where I can study it. It's going to be a close call either way. 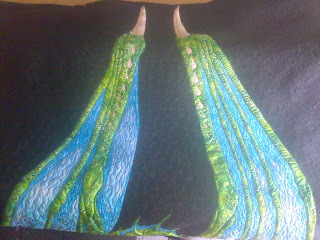 Now you've all had a look I think I need to go and put some more quilting on this little beastie. 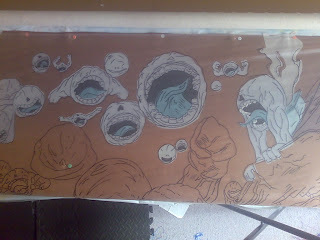 Here is a taste of what is on my frame at the moment. It's a large art quilt for my gallery at the Festival of quilts. I am pretty happy with how it is coming on although like any of my big quilts I get frustrated that I can't see all of it. I just had to unroll what I had done and take a peek. It isn't a great picture, but then conditions there are tircky. Light from the window does save putting the lamps on but it doesn't help show the quilt in it's best light. Also to make things as easy as possible I used my phone to take the picture. Every little saving counts at this point. I love the horns on the wing tips, I think they have come out exactly as I imagine them. I just hope I can get the face right too. 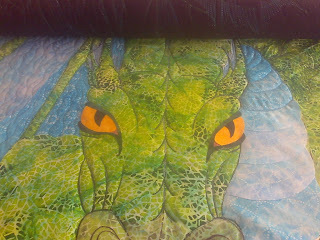 I was very lucky to be able to get the artist of my original dragon to draw the starting art work for this piece and to trace off the quilting lines from the enlarged image. I am hoping this will give the finished piece a strong feel of him as well as me. Well enough chat I've got a lot to be getting on with. I hope you've all enjoyed having a little look at what I am working on. Oh wait there was something else I was going to say. I've been asked to do a meet and greet session at the Festival of quilts. It will be open to people who are attending the evening events on Saturday night. After the show closes there would be a chance to come to my stand and talk to me without the bustle of the show. There is even the promise of a glass of champagne each. So if you going to any of the events that night and would like to come to the meet and greet, get in touch with Twisted Threads for the details. As I am teaching on the Saturday this will be pretty much the only time I am on my stand that day so it will be great to have a chance to meet people I might otherwise have missed. It seems we managed to lead our host astray last weekend, she has joined us here on blogger :) Hopefully it will give all of us a chance to keep up with the goings on at Hobby Holidays. I'm looking forward to seeing her longarm up and running, then the quilts that will flow off it. For now Jo has posted and introduction and a bit of behind the scenes info about running retreats. She didn't even complain about those people who manage to phone in the middle of the cooking frenzy :) If you would like to take a look it's called Hobby Holidays Blog. Now I had better brave the heat in the longarm room again and see if I can get to a point where I can post a photo later. 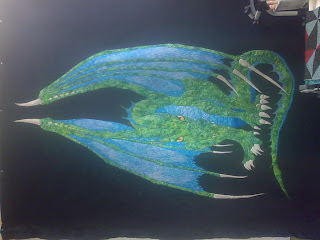 My dragon is coming on pretty well, and I have to have it finished Monday or Tuesday next week so I can quilt a quilt for a friend, who needs it urgently.